Middle East Forum fellow Tarek Fatah appeared on Fox Business to discuss Linda Sarsour's call for "jihad" against "fascists and white supremacists and Islamophobes reigning in the White House" in a speech the annual Islamic Society of North America (ISNA) convention in suburban Chicago on July 1. What so you think of Linda Sarsour and her call for jihad? What message does that send? Every Islamist practices the art of deception. She is no exception. The very fact that you have two meanings of the word 'jihad' means that they can get away every time and backpedal when caught. Why couldn't she have denounced the doctrine of armed jihad before all of America? To come out and say that the doctrine of armed jihad is dysfunctional, does not apply in the era of the nation-state. The United States constitution is above all, nothing matters, no sharia, no jihad. Islamists "cannot digest the fact that men and women are equal in America." Please, you can fool a whole lot of white non-Muslims, but not us. We were born in Islam, we are Muslims, and we know the contempt that is there among Muslim Brotherhood supporters for the United States, for America as a concept, and for human liberty as an idea. They cannot digest the fact that men and women are equal in America. And if you need proof as to who Linda Sarsour is, you should take note of the Muslim Brotherhood flag she wears on her head. That is no requirement of Islam. That is not required as an act of religiosity and does not contribute to anyone's modesty. Had she been modest, she wouldn't have been speaking over there, flaunting the style and the fashion. 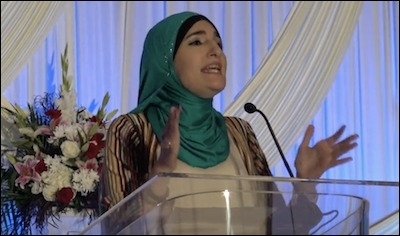 Linda Sarsour addressing the Islamic Society of North America (ISNA) on July 1. Linda Sarsour ... named as a mentor, motivator, and backer Imam Siraj Wahhaj. This gentleman was on the list of unindicted coconspirators in the 1993 World Trade Center bombing. I shouldn't call him a 'gentleman' – he sought to be a terrorist. What are your thoughts about her saying that he's her mentor? Well, he's an African-American Muslim. Linda should explain why the translation of the word 'black' is the same as 'slave' in the Arabic language. She should come forward and talk about the conditions of blacks in her beloved Palestinian territories. What is a black treated like in Saudi Arabia, in Egypt, in all the blessed Arab lands where she finds oppression committed by the United States of America? We had slaves being sold in Yemen and Saudi Arabia as late as 1965. ... [W]here was she when half a million blacks were slaughtered in Darfur in 2005 by Arab Janjaweed, backed by a Sudanese government that was headed by a war criminal? [She is] silent on all of this! ... Where is the solidarity with the black sisters and daughters kidnapped in Nigeria by Boko Haram? She is pulling off the biggest stunt. North of the border, I can't imagine someone getting away with this.